Apple juice is a beverage typically associated with sound nutrition. However, if you're watching your weight, you'd do best to limit your consumption of 100 percent fruit juices to one small serving a day. Drinking lots of apple juice and other fruit juices can make you consume more calories than you think — and liquid calories, even from healthful beverages, can lead to weight gain. 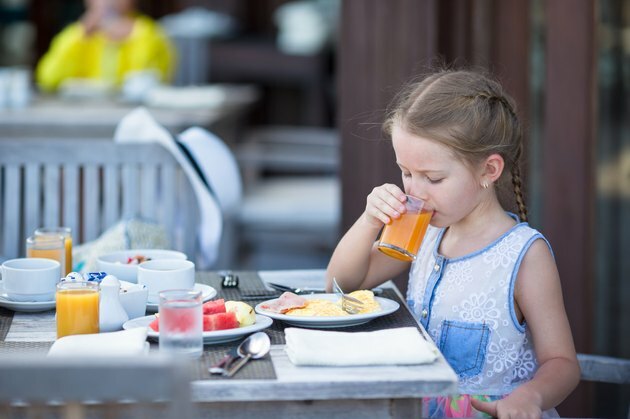 Apple juice and other juices are defined by the Harvard School of Public Health as caloric beverages that impart some of your essential nutrients. Juices, milk and sports drinks are more healthful than beverages with added sweeteners that have nominal nutritional value such as soda pop, energy drinks, sweetened canned and bottled teas and gourmet coffee drinks. When you drink a cup of apple juice, you get the same nutrients you would if you ate an apple; however, you also get around 30 more calories and no dietary fiber. The Dietary Guidelines for Americans 2010 suggests drinking no more than 4 oz. of 100 percent fruit juice a day. One 8-oz. serving of apple juice made from concentrate has 110 calories; the same serving of bottled or canned apple juice has around 120 calories. Apple juice gives you some nutrients. One serving gives you between 2 and 6 percent of your daily value, or DV, for vitamin B-6, riboflavin, magnesium, iron and phosphorous. Apple juice is high in vitamin C, giving you more than 100 percent of your DV per serving. However, a medium-sized whole apple has only 80 calories and gives you 5 g dietary fiber, or 18 percent of your DV based on a 2,000-calorie diet. Apple juice gives you more calories per ounce than a regular carbonated soft drink, despite having the nutritional edge. An 8-oz. serving of cola has 100 calories. Drinking a lot of apple juice and other high-calorie beverages can take a toll on your weight. MayoClinic.com blogger and nutritionist Jennifer Nelson points to a study published in the May 2009 issue of "The American Journal of Clinical Nutrition" that examined the effects of food and beverage calories on 800 adults The study looked at all kinds of caloric drinks, including high-calorie beverages sweetened with sugar such as soft drinks, fruit and vegetable juices, milk and sugar-sweetened tea and coffee. Researchers noticed a 0.5-pound weight loss in study participants at 6 and 18 months when 100 beverage calories were cut from their diet — five times the amount of weight loss than if 100 calories were cut from solid foods. Nelson explains that the high fructose content in these sweet drinks may cause your body to store fat when you drink them over a long period of time. Weight gain isn't the only problem you might experience if you reach for sweet, high-calorie beverages such soda pop and juice. Results of an International Study of Macro/Micronutrients and Blood Pressure published in the February 2011 issue of "Hypertension" indicated that people who drink soft drinks and fruit juices on a regular basis are more likely to have high blood pressure. P.J. Skerrett, Editor of the "Harvard Heart Letter," states that similar studies link consumption of sugary beverages with type 2 diabetes and metabolic syndrome. These health complications are more likely to occur in children who consume sweet drinks. Water is the only fluid you need to hydrate. To make plain water more tasty, mix three to four parts plain water or unsweetened carbonated water with one part of your favorite juice. Can You Lose Weight Drinking Apple Juice? What Are Benefits of Drinking Coke?